Cayra is a neat little concept and mind mapper and in my view is greatly undervalued, probably because Cayra.net is now an advertising site, and the software is no longer supported. But copies can be downloaded from http://download.cnet.com/Cayra/3000-2076_4-10777905.html and other download sites and it is very usable. It doesn’t install easily on Windows 7, so here’s my post on how to install this on that version of Windows. It has some qualities of mind mapping software: Organic lines and colour; but at the same time, the connections it can make allow it to be used to make concept maps with cross links and linking phrases. It even lets you have multiple maps on the same page, and has a good ergonomic design to handle this, providing for ‘parking’ separate maps at the foot of the screen. Nodes can have pictures and hyperlinks, links to files, and dates/times for project management tasks. Be prepared to spend a few minutes understanding how it works, because it is not quite like other mappers, but it is well worth the time, because it has a flexibility that other mappers do not. Its most unexpected feature, perhaps, is that it uses the self-centering mechanism like Topicscape or Brain. Click a node and that moves to the centre and its branches expand. This can be switched off, and it will operate in ‘Fixed mode’. It comes with a help map, but also has built-in help. This is attractive and useful so I’ve flagged it as a “Fave”. I agree—Cayra is unusually attractive and intelligently designed. Unfortunately its development stopped before some very basic features were added (for example, the ability to copy and paste items, requiring you to format each item separately). So why the heck doesn’t someone who can program these kinds of things start a new project based on Cayra’s look and functionality?? It would certainly be popular! Thank you Vic, that was very helpful. I had the same problem with win7/64 and managed to get cayra running by following your post. @koko Thanks for that. That was one of the addresses (among others) that I wrote to in April when I was trying to contact them, but sadly there was no reply. From what I’ve read, Cayra was released in Source Code for a brief period of time. If anyone can point me at the sources, I’ll move it forward. I’m a DotNet programmer with a copuple of decades of experience. I’m looking for OpenSource MindMapping software. Cayra would likely be easy to move forward to Windows7 and probably a pretty easy port to the Mac using Mono. If you know where to locate the sources … please send email. Great offer Kevin. I’ll put the word out on my blog and Twitter and see what can be found. I will also write to the original developers, and see if they are still contactable – I was in touch with them once before. According to this page: http://en.softonic.com/s/open-source-animation-software it was released under the GPL. it is a great mind mapping. I used it to make an experimental poetry writing with it ( not finish yet, because a lack of time ) i will post it to my blog when finish. Thank Vic for the great program here. A fascinating tool – it allows the map to be refocused on to a selected topic – creating a unique view of the map from the perspective of the selected topic. Very useful for concept mapping. I too loved Cayra. 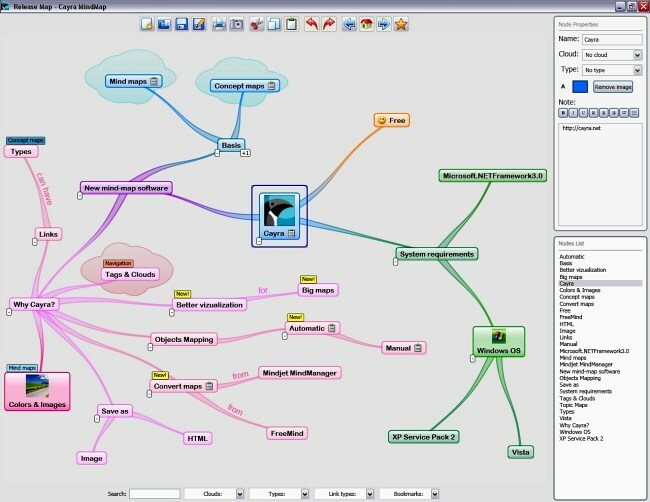 However, it no longer exists and only those who first used it and downloaded it when it was available a couple of years ago can still do any mindmaps with it. I love its organic nature, its colours and design. Don’t expect to see any updated versions I wouldn’t think – same as with MapIt another favourite of mine no longer available. @David, but Cayra does still exist! I gave a link in my article from where it can be downloaded (at Cnet, a stable and reputable source), but a search on “Download Cayra” shows many other software download sites that have it.